Sarah Zimmerman of Repeat Crafter Me is a crafter and crochet designer who often shares her beautiful creations as free crochet patterns and tutorials. She shares on her own website that she's always loved creating and crafting, and that she taught herself to crochet in 2011 using free patterns. She was really inspired by the hidden talent that crocheting unleashed in her and now she pays it forward by offering her own crochet patterns for free to help teach and inspire other people. Sarah is a mom of three (two boys and a girl), each separated by two years between them. They all live together in Orange County, California, where they relocated (from Seattle via Portland) for husband/ dad's work. In addition to sharing her genius in crochet, her website also shares her other crafting ideas and her love of crock pot cooking. Let's review seven of Sarah's crochet patterns that have previously been featured on our site but never rounded up all together. You get 26 patterns in one bunch when you take a look at Sarah's genius alphabet animals. Each letter is represented by a different animal whose name starts with that letter; for example, the B is represented by a butterfly. You could crochet an entire set of these and use them to teach the alphabet to your kids. 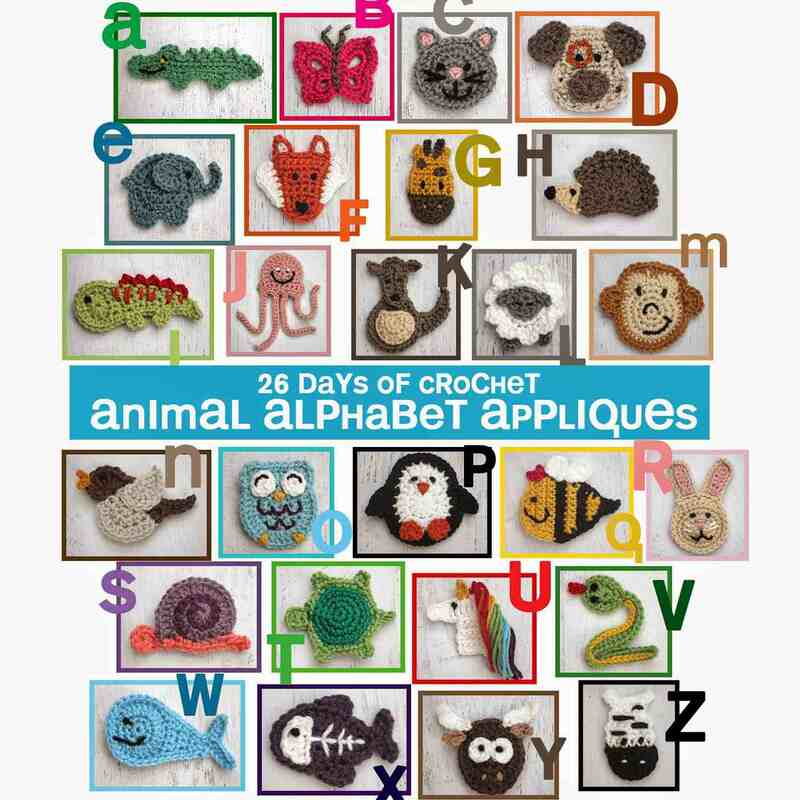 Or you could simply use the patterns whenever you have an animal appliqué project you want to crochet! Sarah's crochet lamb pattern was included in our roundup of sheep, ram and goat crochet patterns. It's not just a pattern for a lamb, though; it's an idea for making a DIY baby mobile that would be perfect for any nursery. This makes a great gift for new babies! Sarah makes beautiful seasonal crochet wreaths and has shared more than one pattern one on her blog. This one is an autumn crochet wreath with rich fall colors that incorporates crochet pumpkins. However, it could easily be altered with different colors to suit any time of year. Candy corn is a great treat, and it also makes for a great source of craft inspiration as we saw in our roundup of candy corn crochet patterns. We had to include Sarah's terrific candy corn crochet pillow pattern in that roundup. It's such a cute design that you could switch up the colors and make other character pillows, too. Sarah's work was also featured in our roundup of watermelon crochet patterns, so it seems she can get inspired by yummy food of all kinds. Her crochet watermelon sun hat is such a great summer design. She's generously written up the pattern in multiple sizes from newborn all the way through adult. It's easy to see that Sarah's work is often inspired by her children. When kids lose teeth, they need a place to put them for the tooth fairy and a crochet tooth fairy pillow is the perfect spot! We began this post with a free crochet pattern that's actually more than one pattern and we will end it the same way. Sarah's Christmas crochet blanket is a set of square patterns, each of which is a corner-to-corner design of a holiday graphic, and a border that reads Merry Christmas. It's one of the best Christmas crochet blanket patterns ever created and true to form she offers it up for free.